Croma a TATA group company, is an Indian retail chain for consumer electronics and durables. It is the nation's first large format specialist retail chain for consumer electronics and durables famous for it's showcase of brands, quality and user experience present across 25 cities in India. The holder of the Gift Card is deemed to be the beneficiary. Beneficiary should announce the intent of using the Gift Card before placing the order. Only valid Gift Cards at the sole discretion of Croma shall be accepted for redemption. Multiple Gift Cards can be used against one bill. Partial redemption is allowed but no refund or credit note would be issued against an unused or partially used Gift Card. Gift Card cannot be revalidated once expired. The Brand may ask for a valid Government identity proof at the time of redeeming the Gift Card. Croma or its affiliates are not responsible on account of the beneficiary sharing the Gift Card number and the Gift Card getting redeemed on that account. Gift Cards will be accepted across all outlets mentioned, but Croma at its sole discretion may add or remove an outlet from the list without giving any prior notice. Croma makes full efforts to accept all Gift Cards but on account of technical /administrative reasons, an outlet may refuse to accept Gift Cards. This Gift Card cannot be redeemed on specific block out dates. Croma may add or delete any date on its sole discretion. The Gift Card cannot be cancelled or returned. This Gift Card is delivered as SMS or EMAIL. The Email or SMS contains the Gift Card Number. Show the SMS or EMAIL to the cashier at the time of billing to use your Gift Card to make payment. NO physical Gift Card is couriered or required. 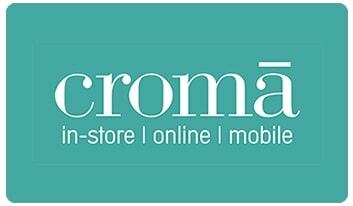 This Gift Card can be redeemed across all Croma stores in India. This Gift Card can not be used online.